Tsuka-Ito – The braid for wrapping the handle. Mekugi – The pin which holds the handle to the sword. Fuchi – The cap at the end of the tsuka where it meets the tsuba. Kashira – The pommel at the end of the handle. Sageo – The cord used to secure the sword to the obi (belt). Saguri – the ornament which helps secure the scabbard when drawn. Kurikata – The knob through which the sageo is passed. Same – The ray skin which wraps handles under the tsuka-ito. 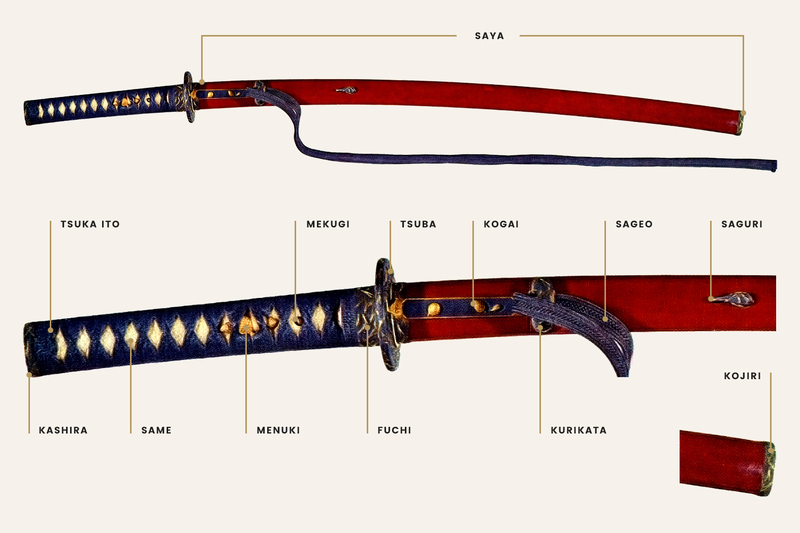 Kojiri – the ornament at the end of the scabbard. Mune – The back of the sword. Boshi – The shape of the temper in the point. Yokote – Line separating the point from the sword. Shinogi – The ridge line running the length of the blade. Shinogi-Ji – the part of the blade between the Shinogi and the Mune (back) of the blade. Nakago – The tang of the blade. Nakago-Jiri – the end of the Nakago. Mune-Machi – The notch on the back of the blade to stop the Habaki (Collar). 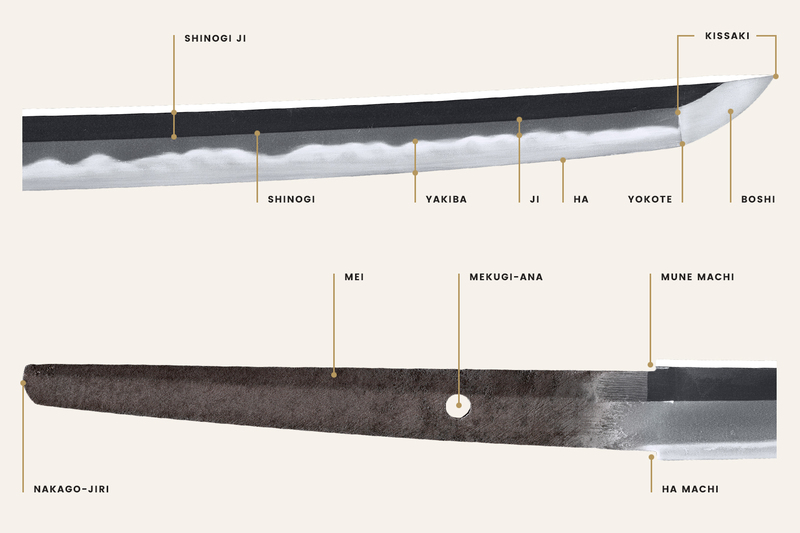 Ha-Machi – The notch on the cutting edge of the blade to stop the Habaki. Mei – The makers signature. Mekugi-Ana – The hole in the Nakago for the Mekugi.